I was invited by Senator Mark Leno to testify at the California Senate Education committee yesterday. I was quite surprised that the California Charter School Association (CCSA) bused in a hundred parents of color to oppose SB322 , a bill primarily about collecting data on teacher turnover and school discipline, to argue the bill would “close charter schools.” That was a little bit of strange overkill on the part of CCSA in my opinion. I did end up modifying my testimony to be much shorter on the fly, but I have included my full thoughts below. Check out the YouTube video below. Btw, also follow Dr. Francesca Lopez on Twitter. She helped immensely with her data and research from various projects she has underway. Please also check out the testimony on SB322 before and after. I am a tenured Professor of Educational Leadership and Policy Studies at California State University Sacramento. As a caveat, I must state that I testify as a subject expert and not on behalf of the CSU or my campus. I have prepared this testimony with input and data from Dr. Francesca Lopez from the University of Arizona. I will begin with charter demographics and achievement. I will utilize the most recent federal data obtained and licensed from the U.S. Department of Education by Dr. Francesca Lopez. I begin with demographics and NAEP achievement comparison between charters and traditional public schools. You can conduct eyeball tests of various percentages, as CCSA did in an SB322 opposition brief, but it is more accurate to statistically test the differences. Dr. Lopez used an h test to test the representativeness of various populations between traditional and charter schools in the NAEP data. A negative “h” means that charter schools are under representative. In summary, African American students are overrepresented in California charters. While Latinos, ELLs, SPED and mostly F/R lunch, although less so, are underrepresented. A new Hierarchical Linear Model study by Francesca Lopez will be publicly released in the next few weeks and will compare achievement on the NAEP between charters and traditional schools in all 50 states. In California, charters perform statistically significantly worse than traditional public schools in 8th grade math by over 1SD. Charters perform better in 4th grade math but it is not statistically significant. Traditional public schools perform better in Grade 4 and 8 NAEP reading, but not statistically significantly better. In sum, traditional public schools and charters in California perform about the same (statistically) on the NAEP in 4th math, 4th reading and 8th reading. However, on the NAEP, traditional public schools in California do statistically significantly outperform charters on 8th grade math. I will now discuss the CREDO achievement data cited by CCSA. Probably the most well known statistical research on charters has been conducted by CREDO during the past several years. It’s important to put CREDO’s results into a useful context. CCSA has cited CREDO’s seemingly impressive “days learning” results in the SB322 opposition brief. 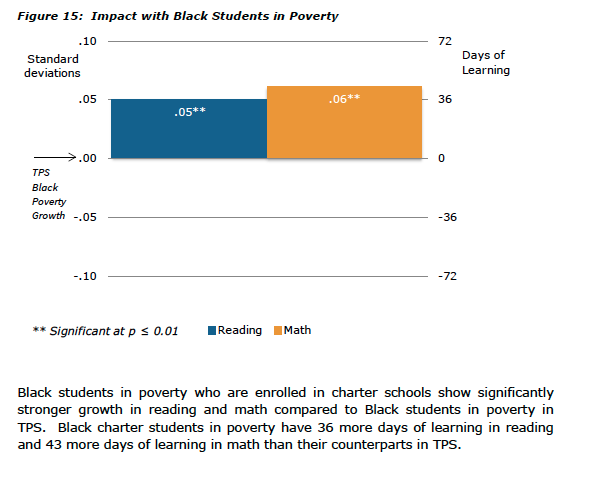 For example, CCSA cited CREDO’s study as reporting 36 more days of learning in reading and 43 more days of learning in math for African Americans than their counterparts in traditional public schools. What isn’t readily apparent in the CCSA opposition letter is that these “days of learning” calculations are derived from standard deviations of .05 and .06. Please let me place those numbers into context for you. For example, a recent meta-analysis of Pre-K published in Teachers College Record demonstrated an effect size of 0.85 across many studies, which is 1700% more impact than the charter effect reported by CREDO. I’d like to speak now speak on CCSA’s school discipline “research” and I say that with quotes on purpose because they have a fatal methodological hole large enough to drive Capitol Corridor Amtrak train through. The CCSA argued that they could arbitrarily reduce the number of suspensions from 10 to 1. With this sleight of hand they reduced their “missing” data from 38% to 6% in their SB322 opposition letter. Is eating 10 ice cream cones the same as eating 1? Or how about buying 10 cars instead of 1? What they’ve done is potentially dramatically reduce the number of suspensions reflected by charter schools. If charters tend to suspend students more than non-charters, the estimates they are using are biased in favor of charters. The UCLA Civil Right Project also weighed in on the charter school association opposition to SB322 by relaying that there should be no exceptions for charter schools in the post FREE CANDY Van (i.e. Charter Lobbyist), Civil Rights Project Response, Lottery Admissions and CREDO on Cloaking Inequity. It is imperative that charter schools fully comply with all state and federal discipline requirements and civil rights guidance to ensure that the civil rights of students in California are not violated. SB 322 will help Charter schools in California fulfill these goals. Therefore, I a concur with the UCLA Civil Rights project’s open letter to the committee and strongly urge that CCSA reverse its opposition to SB 322. From Chile to Denver, the predominance of the peer-reviewed research has demonstrated that choice is problematic without regulations ensure equity, access and Civil Rights. SB 322 will ensure that authorizers and their charter schools remain accountable to California’s communities and citizens. The bill passed 7-3 in committee. For all of Cloaking Inequity’s posts about charters schools click here.